Recently the Secret Victorianist found herself back in London and on the hunt for nineteenth-century culture in the British capital. The National Gallery’s ‘Scenes of Parisian Life’ exhibition is the first dedicated to lesser-known French painter Louis-Léopold Boilly (1761-1845) in the UK. 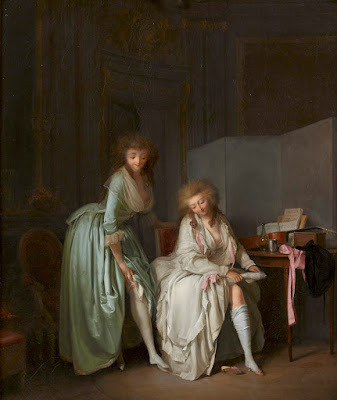 It features around twenty paintings but what the exhibition lacks in scale it more than makes up for in variety, demonstrating the range of Boilly’s subjects and media. Looked down on as ‘just’ a genre painter in his day without the support of the establishment given lauded neoclassical history painters like Jacques-Louis David (1748-1825), Boilly’s output was dictated by public taste and market forces. After arriving in Paris in 1785, he did a brisk trade in scenes featuring young woman in elegant interiors, often with a risqué edge. One of these, ‘Comparing Little Feet’ (1791) was on display at the National Gallery. In it, two women strip off their stockings, ostensibly to compare their shoe sizes. However, in the tumultuous time of the Revolution, Boilly found himself in hot water for his brand of titillating art. He survived with his head but pivoted—to more patriotic subjects, visual illusions and the Parisian crowdscapes for which he is most remembered. 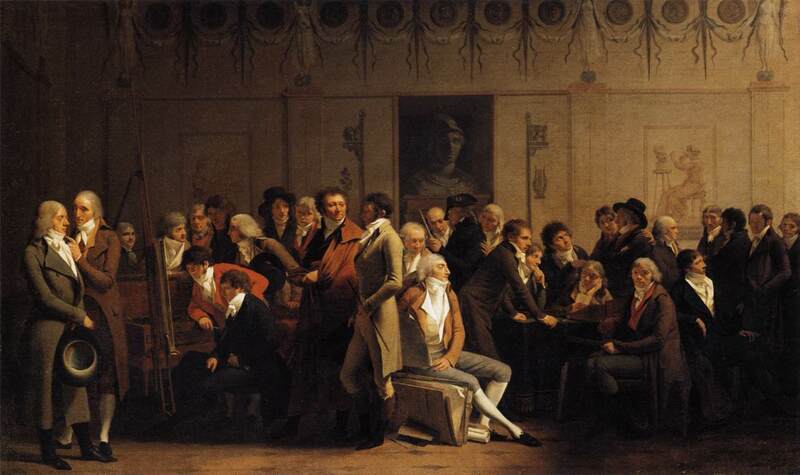 His ‘The Meeting of Artists in Isabey’s Studio’ (1799) (also on view) is a ‘who’s who’ of the Parisian art world at the advent of the nineteenth century, including 31 painters, sculptors and architects and, of course, Boilly himself. Notably, not a single woman is invited to this idealised meeting of the minds, despite the Revolution being an unprecedented period of freedom for women artists. Crowd scenes featured in the exhibition include ‘The Barrel Game’ (1828), ‘The Poor Cat’ (1832) and ‘A Carnival Scene’ (1832). 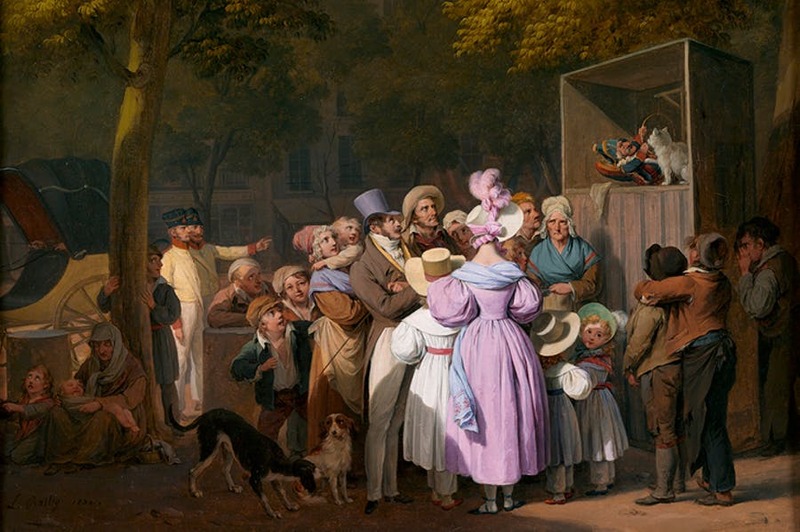 All depict the colourful menagerie of nineteenth-century urban life, with city-dwellers of every class side by side. Hidden in the paintings are dramatic incidents that provoke a smile—a child grasps at an apple, a man urinates against a wall, a boy picks a pocket, a dog runs off with a carnival mask. Boilly’s humour is distinctive, even if his expression in his self-portraits is usually stern. He coined the term ‘trompe-l’oeil’ (a trick of the eye) for works in which uses one medium to imitate another. 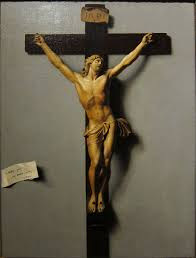 His painting of crucifix appears 3D, while his signature seems to be pinned beside it, a slightly blasphemous advertisement. Observing Boilly’s Paris is like reading Dickens’s London. Never has the nineteenth century looked so alive. 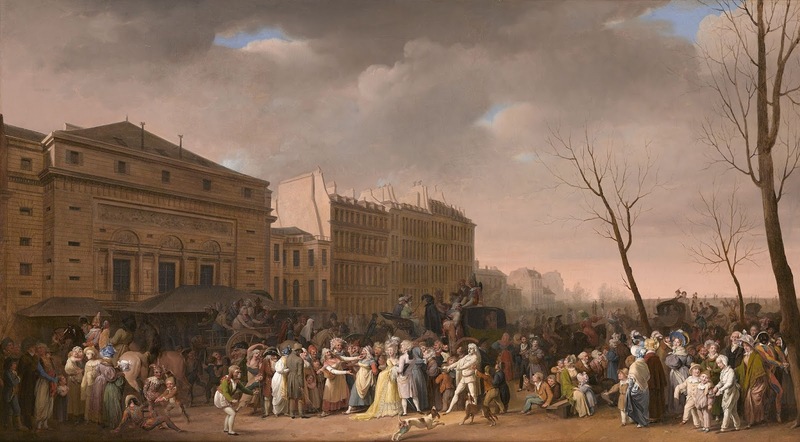 ‘Boilly:Scenes of Parisian Life’ is free and open to the public at The National Gallery until 19th May 2019. Visit if you can. Do you know of any New York-based nineteenth-century-focused exhibitions you’d like the Secret Victorianist to review next? Let me know—here, on Facebook or by tweeting @SVictorianist.